While plenty of you would have created visitor segments based on the demographics,age and gender generally but if there is no filter segmentation done before then there is a pile of audience data that can tell you how your visitors are interacting with your website. With the general navigation on the interest overview in audience reporting section, we can determine the interest of people who visit our website. Adding gender and demographics filters, we can determine which gender has been visiting our website and the age group as well. 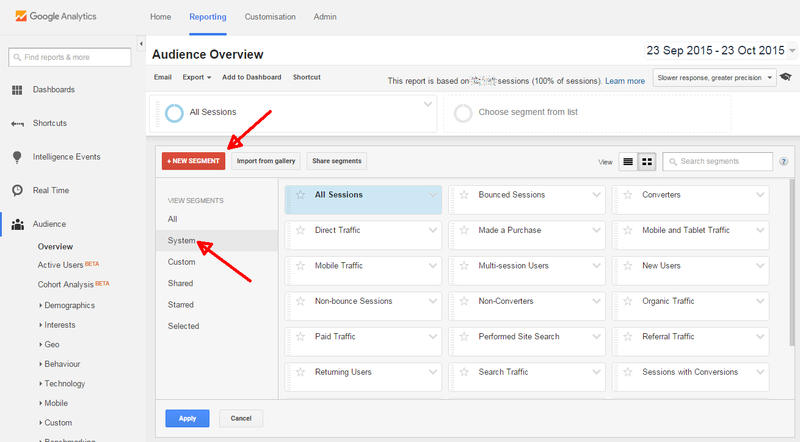 To create a custom visitor segment, go back to Audience reporting and choose the All sessions option. Then try the custom segment based on demographics. Here, you will get the option of “other category”. Fill it with the required category word and then name this custom segment and save it. This feature refines your target market if you add date too. This custom visitor segment allows you to have a more precise target market traffic on your website. When you choose your goal, you must have a rough estimate in your mind of what you want by the end of this quarter so why not assign a monetary value to your goal via Google Analytics? 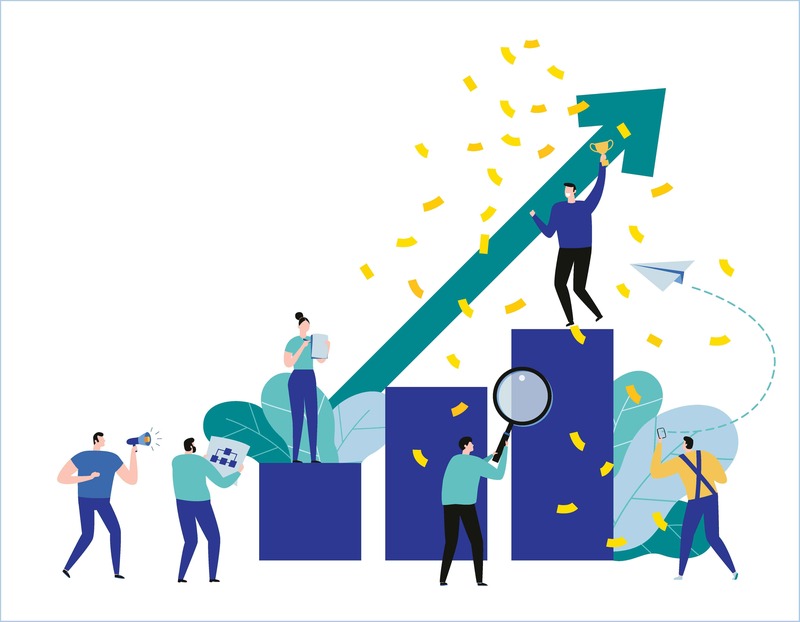 When you assign a monetary value to your goal, it allows you to measure business results in the form of Google Analytics for small business and how much money goes or comes in your account too. To do this, go to the Admin section and click on goals. 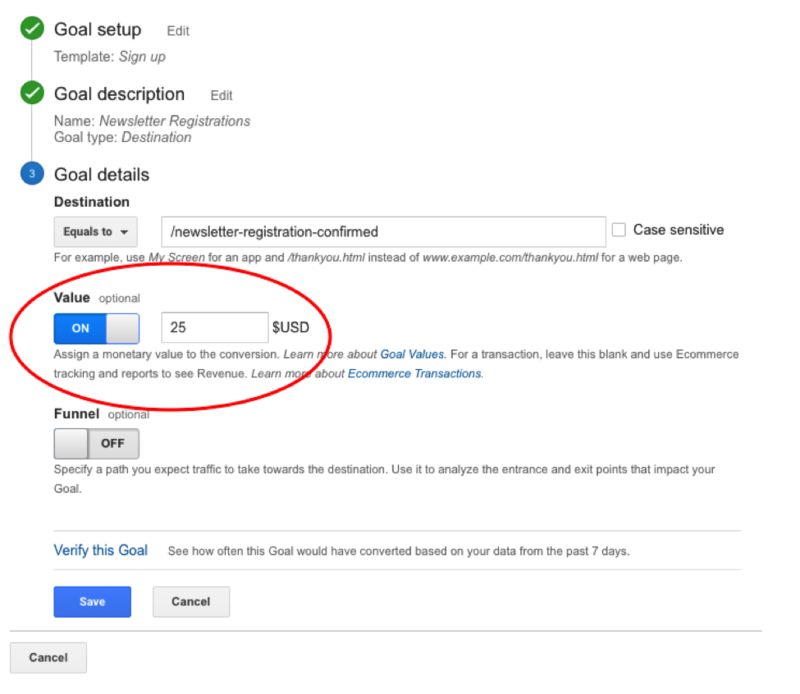 Now when you open a goal, there is a Value optional box, make sure you fill it with a somewhat attainable goal. The ultimate ideal situation of business marketing is that when a potential customer see the ad of your product, then he/she visits your website and make the purchase all in once. But that is not how small businesses grow. You can’t expect people to buy your product right away. Like we were taught in the conventional business marketing tips, digital marketing also works out through the easy and better conversion paths through Google Analytics for small business. The Google Analytics provide a glimpse of your visitor behavior by which you can try to make conversion paths better and easy for potential customers. Go to the conversion reports via Conversions >Multi-Channel Funnels > Top Conversion Paths and here you will find top 10 conversion paths, choose the one which suits your business interests. Fora business, it is pretty obvious to conclude analytic results to Drive Traffic in your way that is why Google Analytics for small business is a valuable tool. It keeps you updated for your website’s daily performance. Usually, we don’t see any huge deviation but when your traffic hits 200% it is definitely unusual. The intelligence events are a feature in Google Analytics which allows to record any unusual activity and send alerts to the account manager. So, when your traffic is 200% then the Google Analytics record this event and the surrounding data and notifies you as an Intelligence Event. Although Google Analytics notifies you for any unusual activity,but it would be great to set up some Intelligence Events. To set it up, go to Intelligence events, then select Custom Alerts, choose the Manage Custom Alerts,go for the +New Alert which will give an interface to create an intelligence event with some other options too. All of this data collection through Google Analytics is useless if we don’t make our way through this with clear points. Plenty of new digital marketers don’t believe in comparing the previous and current traffic trends but it is very important to draw conclusions based on comparison as things are always dynamic and a comparison could give us an investigative data about how our traffic is reacting after some changes and other stuff. One can compare using the Compare to the Previous Period tool available in the date range box. Now you get to see two different colored lines which indicate the difference and performance of traffic over a specific period of time. Annotations are simple notes that you can add on to the Analytics reporting graph for your own sake. Sometimes, you are not the only one keeping tabs on your website, so it may be a good idea to add annotation and make it more comprehensive for others. You can add the annotation of why the sudden change in traffic occurred. It could be from a specific reason and you can make a note and add an annotation. Just click on the downward arrow icon at the bottom of Analytics reporting graph and click on the option for creating a new annotation. One can set it to public or private as well. Google Analytics for small business is a great way to monitor and collect data for digital marketing. When you have so many customized options, then you can really set your targets and measure business results for small business growth.